Now wipe the drool from your face and focus. The Gift Fair is truly beneficial for Meeting & Event Planners. Here at California Host we take pride in making sure our clients have the best experience when they come to our beautiful city. It is incredible how a small gift can be the biggest gesture. There really is nothing better than coming back to your hotel room to find a present waiting for you on your bed. A gift works for every occasion as well. We leave signature gifts of the city we are in for site inspections. Fun gifts that relate to the activity of the day for incentive trips. And even some fun, but practical gifts for meetings and trade shows. What makes the San Francisco International Gift Fair so wonderful is that the gifts are on wholesale! You can stock up for the year and have an endless supply of gifts! Our office has a whole closet dedicated just to gifts, many of which came from the Gift Fair. 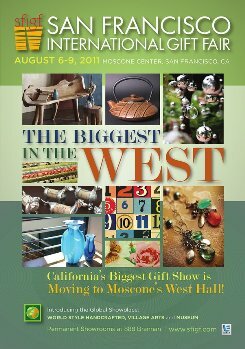 So grab your wallets and your shopping bags at hit up Moscone West this weekend! We hope to see you there! This entry was posted in San Francisco, Tips and tagged Events, Gifts, Incentives, Meetings, Moscone Center, San Francisco. Bookmark the permalink.